The 2010 Chrysler Sebring Touring is the base trim for this midsize four-door sedan. It’s powered by a 2.4-liter four-cylinder (173 hp, 166 lb-ft of torque) that’s mated to a four-speed automatic transmission and gets 21 city/30 highway mpg. Interior highlights for the Touring include air conditioning, stain-resistant seating fabric, a height-adjustable driver’s seat with manual lumbar support, a 60/40-split-folding rear seat, fold-flat front passenger seat, tilt/telescoping sport steering wheel, keyless entry, rear folding armrests with cupholders, a theft-deterrent system, illuminated entry, a four-speaker stereo with CD, MP3 capability, and one-year of Sirius Satellite Radio, two 12-volt power outlets, and color-keyed cluster bezel, instrument panel bezel, and park brake lever. Exterior highlights for the Touring include power mirrors, front and rear solar-control glass, tinted windows, a dark argent grille with bright accents, body-color door handles and fascias, and 16-inch steel wheels with wheel covers and P215/65R16 BSW all-season tires. 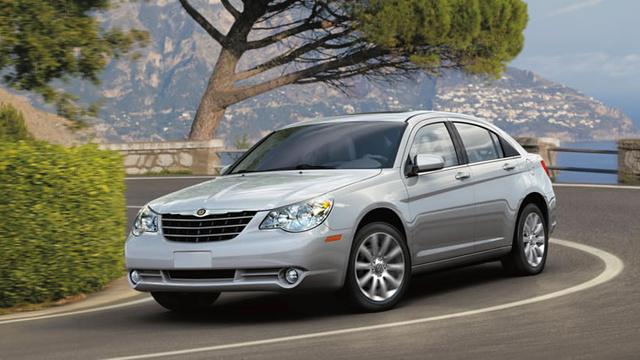 The 2010 Chrysler Sebring Limited shares a standard powertrain with the Limited trim (a 2.4-liter, 173-hp four-cylinder engine with a four-speed automatic transmission that gets 21/30 mpg), but is also available with a 3.5-liter, 235-horsepower V6 with an upgraded six-speed automatic transmission that gets 16/27 mpg. The Limited gets some nice interior additions, starting with an upgraded six-speaker stereo with 6-CD player, rear-seat DVD, MP3 capability, steering-wheel-mounted controls, and one year of Sirius Satellite Radio. Other interior upgrades include heated front seats, an eight-way power driver’s seat, a leather-wrapped shift knob, tortoise shell-style steering wheel and instrument panel, front and rear aimable LED lamps, passenger assist handles, and sun visors with illuminated vanity mirrors. The Limited also has an available media center with a 30GB hard drive with a 4,250-song capacity, six Boston Acoustics speakers, and an integrated GPS navigation system with a touch-screen display. Exterior upgrades include automatic headlamps, heated power mirrors, and 17-inch aluminum wheels with P215/60R17 BSW all-season tires. The Sebring convertible trims mix and match features from the Sebring sedans, and the 2010 Chrysler Sebring LX Convertible serves as the base trim for the convertibles in the Sebring model lineup. The LX Convertible is powered by the same 2.4-liter four-cylinder (173 horsepower, 166 lb-ft of torque) as the Touring sedan and also uses the same four-speed automatic transmission. The LX Convertible gets 20 city/29 highway mpg, only slightly less than the Touring sedan. The LX Convertible comes standard with four-wheel antilock disc brakes and front and rear stabilizer bars. The LX Convertible's interior features air conditioning, six-way power adjustable driver's and passenger seats, stain-repellent seating fabric, speed control, keyless entry, air filtering, a 12-volt auxiliary outlet, dual-note electric horn, Sentry Key theft-deterrent system, tilt sport steering wheel, center console with sliding armrest, LED lighting for the instrument cluster, and a six-speaker 6-CD/DVD/MP3 entertainment system. The exterior features include the power convertible top, hard tonneau cover, illuminated entry, power mirrors, body-color door handles, front and rear solar-control glass, tinted windows, and 16-inch steel wheels with covers and P215/65R16 BSW all-season tires. The 2010 Chrysler Sebring Touring Convertible is one trim level up from the LX Convertible, but with only $1,350 separating the two vehicles, there aren’t major changes. The most significant upgrade is the engine, as the Touring Convertible comes standard with a 2.7-liter V6 (186 horsepower, 191 lb-ft of torque) mated to a four-speed automatic transmission that gets 18 city/26 highway mpg. The Touring Convertible also adds a touring suspension, a key fob to control the power top and windows, powered and heated exterior mirrors, and 17-inch aluminum wheels with P215/60R17 BSW all-season tires. Interior upgrades include a mini trip computer, an instrument cluster display screen, temperature and compass gauge, tire pressure monitor display, premium cushioned center console with armrest, premium door trim panel, and a satin silver instrument panel bezel. The 2010 Chrysler Sebring Limited Convertible is the high end for this model lineup. It’s powered by a 3.5-liter, high-output, 24-valve V6 (235 horsepower, 232 lb-ft of torque) mated to a six-speed AutoStick automatic transmission that provides clutchless manual shifting. The Limited Convertible gets 16 city/27 highway mpg. The Limited Convertible interior features air conditioning with automatic temperature control, heated front seats, steering-wheel mounted audio controls, six Boston Acoustics speakers, leather-trimmed bucket seats, leather-wrapped shift knob, security alarm, luxury door trim panel, tortoise shell-style instrument panel bezel and steering wheel, windscreen, and a universal garage door opener. The exterior upgrades include a power retractable hard convertible top, automatic headlamps, foglamps, chrome door handles, dual bright exhaust tips, bright front door sill scuff pads, and 18-inch aluminum chrome-clad wheels with P215/55R18 BSW all-season touring tires.